John received his early musical training in Sheffield, but as a teenager was able to study with Molly Mack at the Royal Academy of Music through the help of the National Youth Orchestra which he joined aged 13. During this time he won the Gold Medal of the Associated Board, and later won a Foundation Scholarship to the Royal College of Music where he studied with Leonard Hirsch. After further study in Vienna and Siena, John joined the BBC Symphony Orchestra where he played for several years. A growing interest in teaching led to his appointment as principal violin teacher at the Keski-Pohjanmaan Conservatory in Finland. He returns every year to Finland for a series of masterclasses. John now combines a busy performing life with teaching at Trinity Laban Conservatoire of Music and Dance, the Purcell School and the Royal College of Music Junior Department. 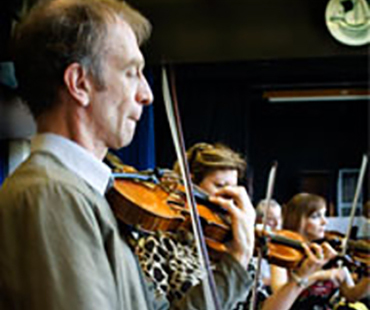 John is also a qualified teacher of the Alexander Technique, and has had a lifelong interest in freedom of movement for musicians. He works regularly as an adjudicator, and leads the Forest Philharmonic and Ernest Read Orchestras as well as Camden Symphony Orchestra.